You obviously can't make a big shift into them all at once ($10K/year/person), but if you have a spouse, you could acquire $40K exposure across the next 7 months. Isn't it really $15k/year/person, if you game it right? That is, $10k electronic and $5k paper via a tax refund? And gaming it by withholding too much, so you are entitled to at least a $5k refund? Looking for verification on all that. As of January 1, 2012, paper savings bonds are no longer sold. This action supports Treasury’s goal to increase the number of electronic transactions with citizens and businesses. See the press release. Those currently holding paper savings bonds can continue to redeem them at financial institutions. Bonds which have not matured, but were lost, stolen or destroyed, can be reissued in paper or electronic form. Series I paper savings bonds remain available for purchase using part or all of one's tax refund. I Bonds are sold at face value; for example, you would pay $100 for a $100 I Bond. I Bonds are not marketable securities, meaning that, unlike other bonds and stocks, you cannot trade I Bonds in the secondary market. Electronic I Bonds - You can buy electronic I Bonds at TreasuryDirect. Purchases may be made in amounts of $25 or more, to the penny. Purchase limits - $10,000 maximum purchase in one calendar year per Social Security Number, with an additional $5,000 in paper I Bonds per Social Security number using your IRS tax refund. Savings bonds purchased as gifts aren't included in your annual limit. You can purchase an additional $5,000 in paper I Bonds per return using your IRS tax refund. The bonds are purchased in multiples of $50, for up to 3 different registrations. Send an estimated tax payment with form 1040-ES before filing your tax return such that your refund ends up being at least $5,000. This will bring the amount you receive as a refund up to the required $5,000. However, note that there is a "due date" for form 1040-ES, usually the end of January the following year. Send a tax payment with form 4868 (request to file an automatic extension) such that your total refund will be at least $5,000. This may be submitted up to April 15th. Taxpayers filing as Married Filing Jointly will be limited in the individual refund amount, as the combined total refund cannot exceed $5,000. Doesn’t have to be either/or. Can be both/and. Personally, we have BND, CD, I bond, tip, floating rate, and savings on the “non-equity “side of things. So there is so much money on the sidelines, it is hard to imagine. are sitting on trillions of deposits. Interestingly, Wells Fargo has pretty consistently been among those offering the highest 2-year and 3-year brokered CDs rates lately. As someone mentioned earlier, some of these banks offer good rates on brokered CDs, but terrible rates for CDs sold directly to customers. They currently offer a 3-year brokered CD at 3.00%, while I see a 39-month direct CD at 1.20% APY for the "bonus" CD. Do you know if there are minimum purchase requirements? And how does one go about purchasing these products? Do I open a CD directly, or is it as part of a taxable account? Also, how easy would it be to purchase similar products from Schwab/Fidelity/Vanguard? For example, I attempted doing a CD ladder in my Schwab Roth IRA account, but realized that I needed to put in a minimum amount of $1000/order. Given that i'm capped at $5500/year, it really won't work too well. For brokered CDs (and bonds), a quantity of 1 = $1,000 face value, so you can't buy less than $1,000 worth of a new issue. On the secondary market it could be a little less, but not much less. At Vanguard the minimum quantity for new-issue CDs seems to be 10. At Fidelity it seems to be 1. I don't have a Schwab account, but based on what you say, perhaps it also is 1. On secondary market, it depends on the particular offer. Minimum quantity could be 1 or it could be 50. I'm not necessarily recommending it, but with $5,500 you could buy five CDs and put the leftover in a fund of some sort, or just leave it in a money market account. I have been buying small quantities of CDs for family member's relatively small accounts. I wouldn't worry about a ladder, but just buy some 2-year CDs, as those are the best deal now. For new issue CDs you'll probably find about the same deals everywhere, which is 2.80% on 2-year and 3.00% on 3-year, for example. Sometimes one broker might have a slightly higher rate for a day or two, or they might come out with a higher rate a day or two before another broker. This is based on just watching Fidelity and Vanguard. I seem to generally find better deals on secondary market at Fidelity than at Vanguard, but good deals on very small quantities sometimes pop up at Vanguard. Also, secondary market commission for small accounts at Fidelity is 0.1%, while at Vanguard it is 0.2% unless you have at least $500K of Vanguard products. There is no commission at either for new-issue CDs. No recent experience with Schwab. You are correct billthecat, as Austintatious also confirmed. I didn't recommend the extra $5K via tax refund because of the additional drag created required to obtain it (and it also slipped my mind). You need to make an interest free loan to Uncle Sam (granted, it could be relatively short if you time things well), take care of the extra administrative work, and then you are rewarded with a paper bond to deal with. I haven't viewed it as being worth the hassle, but others can certainly disagree. Part of my prejudice is just simply that I haven't personally done it before. Now if the fixed rate portion if bumped up a little more in November (from the 0.3% it is currently at), then my feelings may change. Well, having to deal with paper is a major drag. You can buy an additional $10K/year of I Bonds at TD for your living trust using an entity account. You could make your own living trust using the NOLO press book and template, if for no other reason than to get an additional $10K/year of I Bonds. When I was buying I bonds, I was buying $20K/year--$10K in my name and $10K for my living trust. So a couple with a living trust could buy $30K/year. Hey! Wait a minute! This guy has 10 million and he didn't go to an Ivy? What? How did that happen? I would think a couple could each have their own trust. So they could buy $40K/year. $20K in their own names and $20K in the trusts. At the time the 5-year Treasury was 0.78%, so my yield premium was about 1.5 percentage points (150 basis points). So I was guaranteed to earn 1.5 percentage points more per year than a comparably safe fixed-income investment held to maturity, and I did. You were certainly guaranteed to earn the yield promised on your CD. However, you had no way in 2012 of knowing what the total return of any bond fund over the next five years would be. What he said is exactly correct. He was guaranteed to earn a higher return than a comparable safe fixed-income invested (the 5 year treasury). He could for zero additional risk earn a higher return by going with the CD. The bond fund comparison you bring up is irrelevant since it is as you state NOT a comparably safe fixed income investment precisely because its value in five years has significantly more uncertainty than either the CD or the five year treasury. One would hope on average the bond fund would return more than the CD precisely because the bond fund holder is taking more risk than the CD holder. In that particular time period the bond fund holder did not get any reward for their risk taking. In another time period they might have, after all that's how risk works. And Kevin already outlined that quite clearly in his post. Sure. My wife and I each have our own trusts, and one shared trust, so we could buy $50K per year if we wanted. I was single when I was buying $20K per year, but my now-wife, then-partner, also was buying $20K per year (for her and her trust). Look back to the summer of 2012, when Treasury yields were even lower than today. You could have purchased a five year CD then that yielded 1.1%, which might have seemed like a good deal. Between 2011-2012 I purchased a 5 year CD at Ally yielding 2.4% with, I think, a 2 or 3 month EWP. I purchased a 10 year CD at Discover Bank yielding 3% with a 9 month EWP. In 2012 I purchased a 5 year CD at North Country FCU yielding 3% with a 6 month EWP. I held the Ally and North Country CDs to maturity. I still have the Discover CD maturing in late 2021- if I cashed it in prematurely now I would probably get about 2.7-2.8% annualized looking back. Hello Munemaker. My apologies for the delay in responding to your question. Likely you've found the answer on your own. I think you are asking if I needed to register on Vanguard's Financial Advisor portion of the website to use it. The only account I have on Vanguard.com is as a personal investor. Once I logged onto Vanguard.com I was able to access the Financial Advisor portion on the website. No other registration required. Thanks everyone for your help. My lesson learned from everyone's help is there is more than one way to achieve our objectives. I appreciate everyone's help is pointing out some interesting options. This has been a great thread. I'm starting to branch out from just a money market account (2% APY) to other options for "cash" that I may need access to in a pinch but hope to keep saving. Fidelity will do an automated four-CD ladder and handle rollovers etc (1yr ladder APY of 2.56% or 2yr ladder APY of 2.81%). I'm also looking at I Bonds via TD. These would be taxable assets. My state/local marginal tax rate is about 9% and federal is probably 24%. I know (and agree) this isn't either/or, but if I want to get started with just one or the other (CD ladder or I-Bonds), what would folks recommend? at higher state tax rates, you might start looking at treasuries (lots of threads on that) which might start having better tax equivalent yields at the short duration ( I’m not using long treasuries; don’t feel enough returns for the risk). Obviously, munis might make sense, depending on state.... but go only for highest rating and avoid certain areas (again, lots of recent threads). I’m kinda cool on munis at this time; concerned like others about potential defaults when the economy starts cooling and we don’t need to push for yields. I bonds are earning 2.83 percent these days, and earnings are state tax exempt and federal tax deferred. After that first year has ticked off, the redemption penalty is almost certain to be less than that for a CD and after 5 years, there's no redemption penalty. And they're adjusted for inflation. I like them. Onourway, could you recommend a way to compare past return rates of a (for instance) BND to a CD ladder? I know past returns aren't an indicator of future returns but I'd like to compare them anyway for an additional data point. Remember that the stated yield on a CD is its total return. The stated yield on a bond fund is only part of its return - it may be higher or lower than that depending on the direction of interest rates, but generally, over the long term, the total return of a bond fund is greater than simply its yield. If rates do rise, your bond fund is automatically reinvesting at those new higher yields while your CD investments are locked in place. If you continually reinvest dividend income from a bond fund ASAP, are you getting more income payments than the stated yield? In other words, do bond yield numbers assume you are not reinvesting dividends? How would you suggest to compare a low risk bond fund (e.g. Treasury) with a CD - is it fair to compare the APY of the CD with the SEC yield of the bond fun? SEC yield is a measurement today, if the overall market and bond portfolio stayed the same. Drawdowns or gains may occur for a variety of events in any bond fund. The compound APY is comparable and I would make sure you budget your CD ladder so you can hold each maturity to it's redemption date. The YTM is also comparable but doesn't include the fund's ER. YTM is usually based on a 365 day year where the SEC Yield is based on a 360 day year. You can see the difference comparing those 3 metrics. They do what they do. If you hold the CD's to maturity there is no gain or loss just an upgrade in interest rate at par when the CD is reinvested. There are some funds that beat CD's but they are either long term funds or funds that have a large percentage of corporate bonds. Higher rates can limit that. With a ladder you're trying to hedge future interest rates without incurring a loss of principal of any kind. Less volatility regarding that as shown in historical credit spreads and duration risk. Look at Agency bonds also. They can compete yield wise with many bond investments and some are state tax exempt also. The 0-year yield is your TEY for the Vanguard Treasury money market fund (minimum investment to open is $50K). The other yields are what Fidelity currently is showing on it's yield overview web page. The Treasury yields may be slightly inflated, as they are for larger quantities and for maturities that might be as much as a month or so longer than indicated. Each muni yield is for the top-yielding muni at that maturity, and may be for a muni that is undesirable for one or more reasons, such as being in a risky state, having call options, etc. ; you certainly will get a lower average yield if you diversify sufficiently and filter out undesirable criteria. With these caveats in mind, Treasuries are the clear choice out to at least 1-year maturity. Treasuries are about tied with CDs at 2-year maturity, and although you might get a slightly higher yield on a 2-year CD (with the caveats in mind), I'd probably still go with the Treasury due to much better liquidity (only a consideration if you might sell before maturity). AA munis start to look better at 2-year maturity, but with the caveats in mind, perhaps not be nearly as much as the chart indicates. Note how flat the Treasury yield curve is beyond 1-year maturity. I personally will be putting new money in taxable accounts (proceeds from recently-matured CDs) into Treasuries with maturities of less than one year. Others will advise that staying short term increases your reinvestment risk, even though you are not being compensated for taking the extra term risk. As shown, someone paying 9% state tax would choose 1-year Treasury over a 1-year CD (no need to pay a penalty with a 1-year security). A 1-year Treasury will provide a higher 1-year return than the I bond after the penalty, unless inflation for the second six month composite rate calculation is much higher than that used to calculate the rate for the first six months (2.32%). The real rate on the I Bond is 0.5%. The real yield an the 5-year TIPS is 1.05%, and last I checked, you get about the same 1% real yield on a 1-year TIPS, so twice that of an I Bond, and more than that after paying the I Bond penalty of three months of interest. I would prefer a TIPS in an IRA over an I Bond in taxable. One might even do better with a non-tax-deferred TIPS in taxable, but it depends on the inflation rate, as taxes are paid on the nominal interest. As with the nominal Treasury curve, the TIPS yield curve is very flat (actually slightly inverted from 5-year to 10-year maturity), so I personally would not take the extra term risk of going beyond 1-year maturity. I have been following your thoughts on where on the yield curve to invest with great interest, but I am starting to think that it might be short-sighted to shift CD investments to shorter maturities because I spent so much of the last decade kicking myself for not locking in for longer terms what looked like low rates in the late 2000s. By holding my nose and keeping the 5 and 4 year rungs of my CD ladder populated I protect myself should the economy tank in 2 years and rates come shooting down again. I would have been delighted with a 3.55% yield just 2 years ago. If I'm wrong, well, it is only 20% of my CD investment and there are CDs coming due every year. My state tax is going to be 5% next year, which isn't high enough to justify investing in Treasuries except, as you pointed out, the very short ones. When I look at those Munis all I see is Illinois and I remember that the ratings on bonds may be very stales. What I really don't understand is why there is no agitation for favorable tax treatment of interest, at least for those of us nearing retirement who need more safety. Some would suggest that the "economy" is already tanking and that we're on the brink (and maybe already started) into a recession. Whether true or not, what happens to interest rates should the country suffer a profound and prolonged recession? As the need for economic stimulation increases in a recession, so does the Fed's motivation to ease off on rate increases and/or decrease rates, right? If that happens, maybe scooter57 will be happy (not to mention prescient) to have hung on to those long-term CD rates. One would have to ask oneself if even longer CDs make sense. There is an interesting article in Bloomberg today about the huge amount of junk bonds that come due between 2023 and 2025 issued by companies like Netflix and Tesla with very dodgy covenants. This is the junk stuff. There is a lot of borderline investment grade stuff also coming due in that time frame. That may give the Fed no choice but to keep rates low to avoid another credit collapse. A 7 year CD might be worth considering, even though there is really no premium for going longer. Others will advise that staying short term increases your reinvestment risk, even though you are not being compensated for taking the extra term risk. I still have some CDs with maturities in the 4-5 year range (one I was lucky enough to get at 4.20% APY). I'm also continuing to hold all intermediate-term (and a little in long-term) bond fund positions in taxable and tax-advantaged accounts. These help hedge against falling-rate scenarios. The yield curve was flat/inverted before every recession since the early 1980s, yet rates continued to fall. But the curve also was flat/inverted before recessions between 1950 and 1980, when rates generally increased. Rates now are closer to the 1950s than between 1980 and the late 2000s. Maybe that's part of why I'm more averse to term risk than to reinvestment risk at this point. 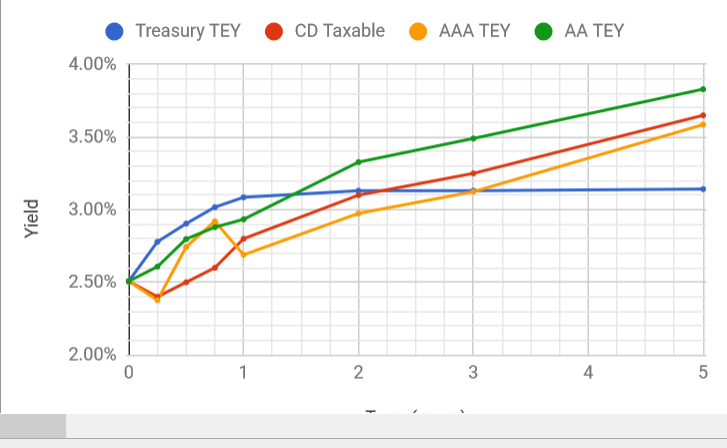 Yeah, Treasuries still have higher TEY for you in taxable out to 1-year maturity, and are about tied in an IRA. If you want to extend maturity beyond that, CDs have a clear advantage over Treasuries if investing only for yield (as opposed to possible negative correlation with stocks in a flight-to-safety scenario). I also did mention that the muni yields on the chart were for munis that may have undesirable characteristics, one of which is being in high risk states. I actually did buy some IL AA/AAA munis about a year ago, and the rating on one of them was actually increased after I bought it. I wouldn't load up on them though, and started filtering them out of my searches once they got to a reasonable percentage of my muni portfolio. Most Bogleheads are just going to stick with their intermediate-term bond funds, and ignore all of this discussion. Do both concurrently in varying degrees of liquidity. 1 Cash, high yield accounts. The Fed might leave the rates as is if the market completely collapses. Rates are low. There seems to be a movement out of stocks into bonds today. My best 3 year CD ladder from Fidelity yields slightly over 3%. That 10 year Farm Credit Bank new issue still looks tempting if 4% at par is worth the extra term and boosts income to another level for awhile. No call protection however. I went over and opened a Fidelity account so I could see what they had to offer that Vanguard did not only to find that ll their higher yielding CDs had call provisions. That completely defeats the purpose of a long CD. There are fewer Vanguard CD offerings but they are the same as the Fidelity offerings without call provisions. Yes! That would be me. I use Vanguard money market funds for short term savings and intermediate-term bond funds for investments. No certificates of deposit, no Treasury-only funds, no short-term mutual funds. I read the discussion, but I ignore it. Stay the course! Well can't hold till maturity with no call protection. It depends on which bank the CD is from. Most banks have call protection but some just don't. Wells Fargo and Citi bank do but JPMorgan and Bank of India rarely have call protection. Have to reinvest manually then if that is going to be a problem to avoid the callable CD's. At this point I wouldn't use auto-roll for Treasuries or CDs. First, one may offer higher yields than the other at different maturities, as has been the case lately (and in taxable accounts, I might also look at munis). Second, one can often find higher CD yields on the secondary market, and I've found that Fidelity offers a better selection in this case, as well as 0.1% commission for all customers (compared to 0.2% for smaller accounts at Vanguard). Third, there might be exceptional direct CD deals that I might want to take advantage of, as had been the case for much of the last eight years or so until more recently. Fourth, if there are no great direct CD deals, I might want to target certain maturities based on the yield curve (I put this last, since I understand that there are solid arguments against doing so).